Labour leader Jeremy Corbyn said he was delighted to visit Hastings and present his party's 'vision for the future' as he declared his love for the town. Mr Corbyn made a speech at St Mary in the Castle today (Thursday, January 17) where he called on Theresa May to take a potential no-deal Brexit 'off the table'. 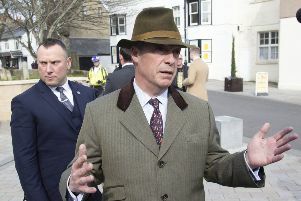 Afterwards, he spoke exclusively to the Hastings Observer about his love for the town and his hopes for turning Hastings and Rye into a 'red constituency' after Labour candidate Peter Chowney missed out by just 346 votes in 2017. When asked for his views on Hastings, Mr Corbyn said: "I love it. "I've been here many, many times as I explained in my speech. I have been camping up in Battle at various times and cycled all around here. I love cycling all along the front of Bexhill, through here and over to Rye and then right along the coast all the way to Lydd. Beautiful. "I love it and Hastings has a unique feel about it as a town. I love how you've got the Jerwood, I love the fish museum down there and the park going up the funiculars - I took my family up there one time and we had a fantastic time. "It's a lovely place. I love coming here. I didn't need any persuasion to come to Hastings today at all. I am delighted to come." Hastings and Rye voted above the national average in favour of Brexit (55 per cent) two and a half years ago and Mr Corbyn, who stopped short of committing Labour to a second referendum or 'people's vote', said the national vote had to be honoured. He added: "I would say to people that voted leave or remain, you still need a Labour government. You need a Labour government for health, you need a Labour government for housing, you need a Labour government for schools and bring people together. "I was pointing out the different parts of the country the issues are exactly the same. I don't want people to be divided about how they voted two years ago. We have to have trade with Europe, we have to have protection of rights, we don't want to turn this country into an offshore tax haven so those are the principals behind it. "There was a referendum here like everywhere else and that was the decision for the people of Hastings. It was a national vote and we've got to abide by that."